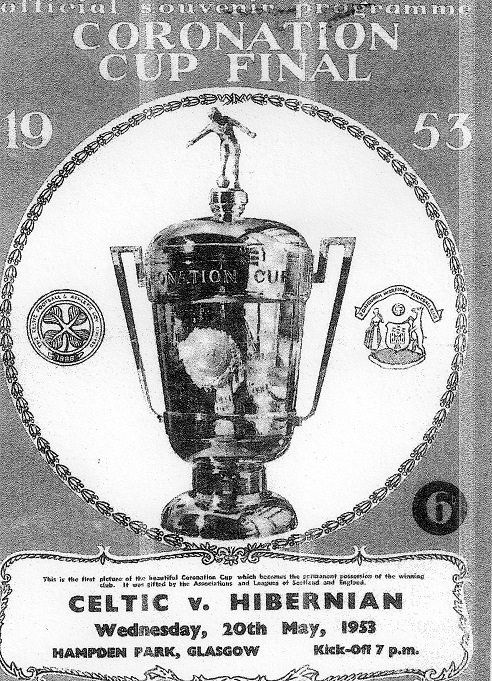 On this day in 1953, just before 7pm, the players of Celtic and Hibs came out on to Hampden Park to contest the Coronation Cup Final. The heavy rain the previous day had been quickly absorbed by the dry pitch, making the underfoot conditions well-nigh perfect. Hibs were at full strength and probably favourites, their forward line – known as the Famous Five – more than compensating for an uncertain defence. 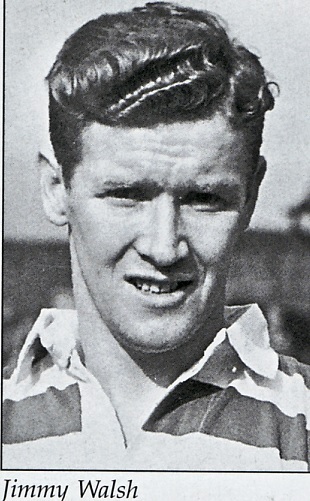 Celtic had been forced to make a late change, Charlie Tully having failed his late fitness test, so Willie Fernie was drafted in as replacement. 117,060 fans were reputed to be in the stadium for the contest. However, due to the entrance gates being closed at the Celtic end – due to over-crowding in the terracing – around 6,000 more were milling round outside, unable to get in. With the bulk of the crowd supporting the Glasgow side, it came as no surprise that Celtic pressed from the kick-off, with Willie Fernie in cavalier mood on the wing, repeatedly racing past Govan and other defenders in thrilling runs. Twice in the first ten minutes Hibs keeper Tommy Younger had to dive at his feet to save certain goals. The pressure eventually told in the 28th minute. A clearance by Jock Stein was flicked on by Fernie into the path of Neilly Mochan. He pulled it on to his right foot and, from about 30 yards – although the distance seems to increase as the years roll on – he sent a ferocious shot past Younger into the net. The Celtic fans celebrated long and loud but were nearly silenced just a minute from half-time when centre-forward Lawrie Reilly latched on to a pass from Gordon Smith to hit a fierce drive, which was well held by John Bonnar. Like the end of the first half, the second was a series of almost continuous attacks by HIbs, whose players were right on form. The wing-halves, Buchanan and Combe, skilfully moved forward to augment the forward line, the Famous five of Gordon Smith, Bobby Johnstone, Lawrie Reilly, Eddie Turnbull and Willie Ormond, which seemed to chose that particular night to demonstrate just how talented they were. But Celtic survived, as their players met the challenge. Jock Stein was immense against Lawrie Reilly; Bobby Evans grafted tirelessly in both attack and defence; John McPhail’s splendid distribution led to some dangerous Celtic attacks. And at the back, John Bonnar, often criticised for being too ‘wee’ to be a dominating keeper, chose that evening to give what many Celtic historians might describe as the finest performance ever given by a Hoops keeper. His bravery and anticipation saved certain goals on several occasions when the Hibs attackers broke through. On the one occasion he was beaten, McPhail had stationed himself on the line to head the ball clear. …….and the inside left made no mistake, to the delight of his team-mates and the relief of the support. Only seconds later, the referee blew the whistle for full-time and the Celtic supporters celebrated, delighted that their side had won an all-British trophy for the second time in 15 years. This entry was posted in Coronation Cup. Bookmark the permalink.